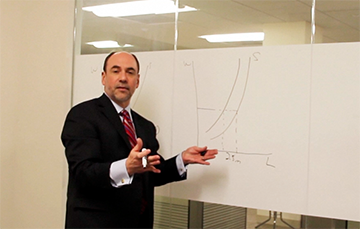 In a new #Eakinomics video, American Action Forum (@AAF) President Douglas Holtz-Eakin (@DJHEAKIN) clears up the confusion on the Affordable Care Act & the CBO report with a step-by-step explanation of exactly how the law’s incentives affect employment. The CBO report found the ACA will eliminate 2.5 million jobs by 2024. “If we had a policy that raised wages by taxing labor and it got rid of 2.5 million jobs, we would say we killed 2.5 million jobs. If we had a mandate that made it more expensive to employ people, raise the effective wage for employers, we would say we killed off 2.5 million jobs with that mandate. In this case the ACA has effectively killed off 2.5 million jobs; it is just an indirect effect. The fact that people have the option of retiring means that the ACA has an implicit tax on labor. Employers have to pay higher wages in order to lure people from their homes into the workplace. Those higher wages make 2.5 million jobs unprofitable for employers to offer. And the ACA tax kills off the jobs,” says Holtz-Eakin in the video.